This section only applies to enviro Classic* Visa* and enviro GoldTM Visa cards for personal use. If you have an enviro ExpenseGoldTM Visa or enviro Expense Classic Visa card, you’ll need to know who Account Administrators and Authorized Users are for our business use cards. Primary Cardholders and Authorized Users of enviro Classic and enviro Gold Visa cards do not have the same responsibilities and access to their Visa account information. The Primary Cardholder is the person who applied for the Visa account. They’re responsible for all charges on the Visa account. They own all the reward points earned on the account and can redeem them. The Primary Cardholder can give other people permission to share the Visa account by adding Authorized Users to their account. The Authorized User has a credit card with their name on it, issued on the Primary Cardholder’s Visa card account. The cards we issue to Authorized Users are sometimes called ‘supplementary cards’ or ‘additional cards’. The reward points belong to the Primary Cardholder and can only be redeemed by them. Authorized Users will not be able to redeem points, unless they have been designated as an Authorized Redeemer by the Primary Cardholder. Remember, even if there are Authorized Users on the account, the Primary Cardholder is responsible for the account and promises to pay Vancity for all fees and interest we charge on the account and all the transactions. Any purchases made by an Authorized User will appear on the Primary Cardholder’s monthly statement. Authorized Users should keep in mind that the credit card account belongs to the Primary Cardholder, and any purchases Authorized Users make using their card won’t help build their credit history. For more details on these different cardholder roles, please review your Vancity Credit Card Agreement (for Personal Use). How do I know if I’m a Primary Cardholder or an Authorized User? You can check if you’re a Primary Cardholder or Authorized User on the Manage my Visa card website. If you’re the Primary Cardholder, select ‘Account services’ from the menu on the top of the screen. Then select ‘Add an Authorized User’ to view a list of current Authorized Users on your account. Primary Cardholders can also see the names of all cardholders on their Visa statements (under ‘View eStatements’). If you’re an Authorized User, you will not see ‘Account Services’ from the menu on the top of the screen. Still need help? You can also call us at 604-877-4999 or toll-free 1-800-611-8472. What Visa account information do I have access to? Who has access to the Vancity Rewards website? 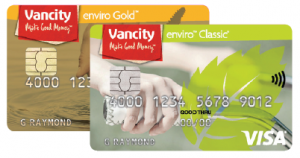 Only Primary Cardholders can access the Vancity Rewards™ website to redeem points. The reward points belong to the Primary Cardholder and can only be redeemed by them. Authorized Users will not have that option, unless they have been designated as an Authorized Redeemer by the Primary Cardholder. Please note only Primary Cardholders can view and add Authorized Users to their account. Once your request has been reviewed and approved, we will send you a notification via the Manage my Visa card website and your card in the mail. What is an Authorized Redeemer? How do I add one to my Visa account? An Authorized Redeemer can redeem reward points on the Primary Cardholder’s behalf. An Authorized Redeemer doesn’t have to be an Authorized User. Only Primary Cardholders can add Authorized Redeemers to their account. When an Authorized Redeemer is added to an account, they are being granted permission to redeem the Primary Cardholder’s Vancity Rewards points over the phone through the Vancity Rewards Service Centre. The Authorized Redeemer will need to call the Vancity Rewards Service Centre at 1-866-661-3377 for verification purposes before they can redeem points on your behalf. Please note the Authorized Redeemer can only redeem points over the phone and not through the rewards website. Need help? Call the Vancity Rewards Service Centre at 1-866-661-3377.
Who are Account Administrators and Authorized Users?